Riverview faculty is participating in a book study entitled "Teach Like A Pirate" written by Dave Burgess. This year the faculty will be studying and incorporating what it means to teach like a pirate. Riverview is happy to announce September's Stand Strong Honorees. Each of the students did a kind act such as saying "thank you" when receiving his lunch, by repeating the stand strong steps, helping someone who was hurt, and by being there for someone who needed help. Great job for Standing Strong! Keep up the great work! Riverview is proud to announce September's Captains of the Month. Riverview faculty members selected and wrote the following about Mr. Hanosek, Mrs. Lopez, and Mrs. Nielson. Mr. Hanosek goes above and beyond the basics in technology. He is always willing to help faculty and students with any technology questions. Mrs. Lopez is an awesome first grade team member. She is always looking out for others. Mrs. Nielson is very kind and helpful. She keeps this boat floating! Congratulations! 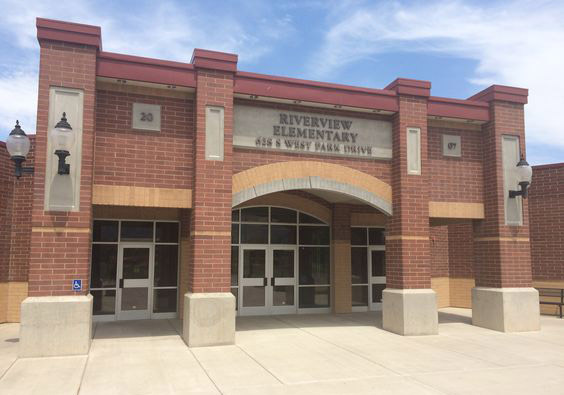 Thank you for everything you do for Riverview! Riverview is proud to announce September's Pirate of the Month for each class. Riverview Celebrates National Talk Like A Pirate Day! Riverview faculty celebrated National Talk Like a Pirate Day by dressing up as pirates and speaking in pirate voices. Luckily no teachers had to walk the plank today! Happy National Talk Like a Pirate Day! Second Graders Celebrate National Talk Like A Pirate Day! Mr. Hanosek and his second grade class celebrated our school theme of pirates. Saturday, September 19th is National Talk Like a Pirate Day. Riverview students dressed up like pirates and enjoyed some fun activities. Students and teachers had a lot of fun speaking in pirate voices throughout the day. Happy National Talk Like a Pirate Day! The 1st graders are studying Community Helpers this week. They were able to tour the ins and outs of our local ambulance! We love our helpers and thank them for their service! First Grade Celebrates Zero the Hero! 1st grade recognized Zero the Hero on the 10th and 20th days of school. To solidify number sense, the students created a tie-dyed shirt with a zero pattern on the 10th day of school. The shirts were prepared by the teachers and Zero the Hero delivered them on the 20th day. The students and teachers loved the excitement and recognition of the zero as a place holder. They look forward to more visits from Zero! Please help share the excitement of the zero days in school by reminding children and neighbors to wear their shirts! On Patriot Day, September 11, Mrs. Nielson and Mrs. Callister's second grade class invited the First Responders of Spanish Fork City to Riverview to say thank you for the work they do to help our community. Some of our local firefighters, EMTs and Police Officers brought their vehicles and gear to show to all of the Second Graders. We learned a lot, and enjoyed giving our thank you letters to these everyday heroes. The 4th grade classes at Riverview demonstrated their understanding of the scientific method with an egg drop. The goal was to not let their egg crack after being dropped off the roof of the school. Students built their own project in hopes of keeping their egg safe. Students took notes on the process of the scientific method. The students enjoyed watching their eggs fall from the roof to see if they would survive.